July 21, 2015: A note from the Secretary of the HPAC: "I have spoken with the Chair of the Council who asked me to advise you that the Council is making good progress on its report and expects to soon submit it to the Minister"
We have had some back and forth communication with the HPAC. Some additional questions and information sent. We also had an excellent meeting that allowed us to better-understand the process that the HPAC has taken and some of their challenges to work out the best process to assess our application and the Paramedics who applied ahead of us. With the Paramedics report now out, we were assured that the Council is now working on the Massage Therapy Application with full focus. An update was sent to all Members and is accessible in the Members-Only area of the website. We have once again had some activity related to our quest for regulation. The Health Professions Advisory Council (HPAC) sent a letter to the MTAM (download) on July 25, 2014 asking for additional clarification and information as it relates to our application. "The Council has reviewed your email and notes your understanding that the Council’s recommendations would be submitted to the Minister of Health by Spring 2014. The Council has asked me to advise you that it is making steady progress to complete its investigation of MTAM’s application and is working toward completing its report to the Minister within the next six months." Not exactly the response the MTAM and members had hoped for, but there is a specified date that holds some promise and we must give credit for a response by the June 21, 2014 deadline. The MTAM Legislation Task Force met recently and is preparing a series of responses dependent on the final outcome of the HPAC's work or, as in this case, a further delay in a final report. It was the Task Force's opinion that the HPAC has a good deal of work to do in investigating and especially if making recommendations for our regulation. It would not be just a final decision on regulation they are working on but also detailed plans on how things will be run, and so we are giving them respectful space to do their job well. We are expecting the HPAC to meet the Minister's Spring deadline and send their recommendations for regulation of the Massage Therapy profession before June 21, 2014. We have heard from the HPAC that this will be the case and, while cautious, are hopeful that they will meet that deadline. We will continue to write and correspond with the HPAC and the Minister's Office to encourage that the publicly-stated deadline be met and to meet to discuss the recommendations or ask for a final decision in a timely manner. In the course of reviewing the MTAM's application, the HPAC sends by email all the documentation and submissions made by us and by others to all the participants in the application process. This includes our last response to the questions posed by HPAC back in July among other documents. The Province of Manitoba has informed the MTAM that its application for regulation will not receive a final report until the spring of 2014. The MTAM awaits further direction from the HPAC or a decision of the HPAC. The MTAM completed its response to the questions of the HPAC and they were submitted. The MTAM receives correspondence from the HPAC asking 20 Questions which required further input from the MTAM with respect to the original application, its responses to submissions, and other items generated by the Council. The HPAC holds a Public Hearing for the application for regulation by the Paramedics Association of Manitoba. The MTAM completes its submission to the Health Professions Advisory Council (HPAC) in response to the 24 submissions. Online public response to the MTAM application for regulation of the Massage Therapy profession concluded with 24 submissions. The Health Professions Advisory Council (HPAC) reviewed the submissions made with respect to the application for Regulation of the Profession of Massage Therapy. The Council then shared those submissions with the MTAM who in turn responded to the comments. MTAM President Susan Kos-Whicher, RMT, announces a public campaign to support the recent application for recognition of the profession of Massage Therapy as a 'Regulated Health Profession' in Manitoba. The campaign features advertising on transit buses and transit shelters in Winnipeg and Brandon. It emphasizes that Massage Therapists want to be #24 - the 24th Health Profession to be regulated by the Province of Manitoba. The MTAM on behalf of its 750 members makes application for regulation of the profession of Massage Therapy under the new RHPA. 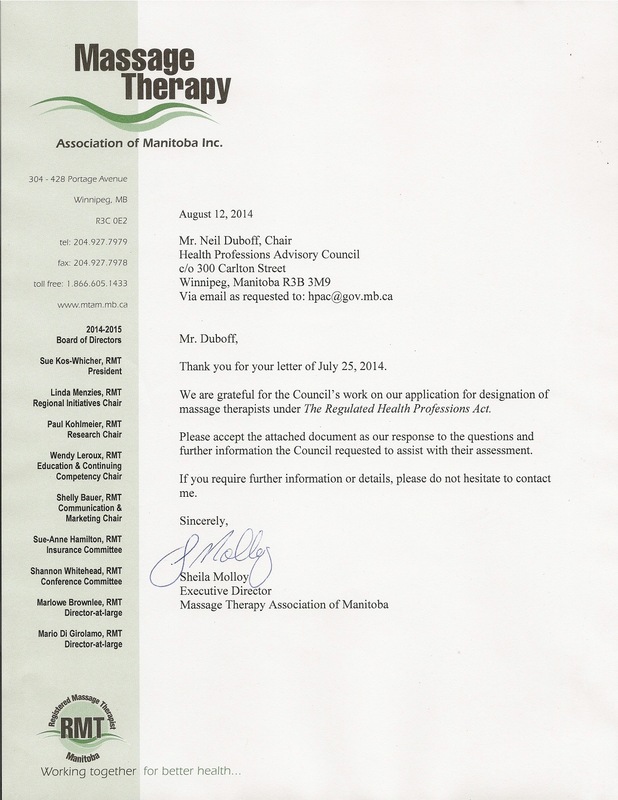 On May 2, 2012 - MTAM President Susan Kos Whicher, BA, RMT, signed the official application to the Minister of Health for massage therapy to be a regulated health profession in Manitoba, under the Regulated Health Professions Act. The MTAM anticipates that the profession will be the 24th Health Profession to be regulated in the Province of Manitoba. There are currently 22 professions that are regulated. The Paramedic Association of Manitoba submitted application #23. The Province of Manitoba proclaims two sections of the RHPA establishing a Health Professions Advisory Council and an application process for professions who want to become regulated. A group of persons representing a health profession who wish to be regulated under The Regulated Health Professions Act must apply for such designation. The Regulated Health Professions Act (Bill 18) received Royal Assent on June 11th, 2009. Twenty-two professions currently regulated will, upon proclamation of the new Act, begin a transition to the new structure. MTAM supports this new legislation and hopes to begin an application process soon.